I finally knit my husband a pair of socks. Sort of. 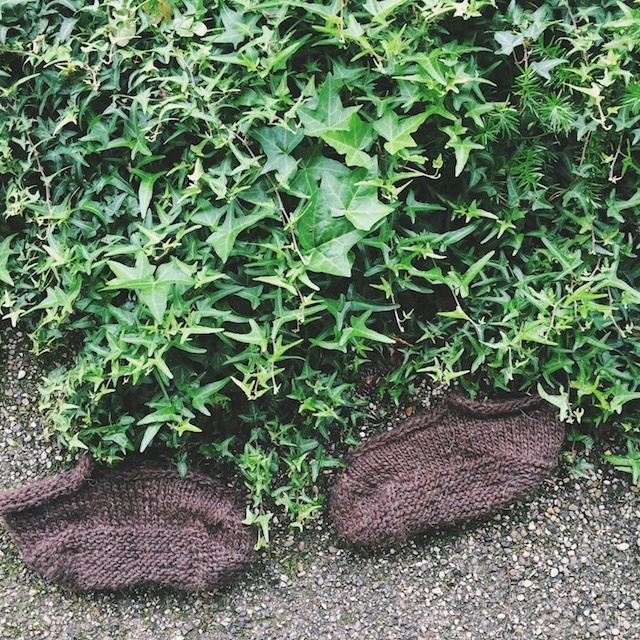 They're his and her matching Inniskór slippers from Chelsea Berkompas' book The Wool Project. Now we're matchy matchy twins- every husband's dream. Only, he wasn't around for photos, so I improvised. I like the way the design is complimented by the Lopi. It's all kinds of rustic and warm. He really does like them. 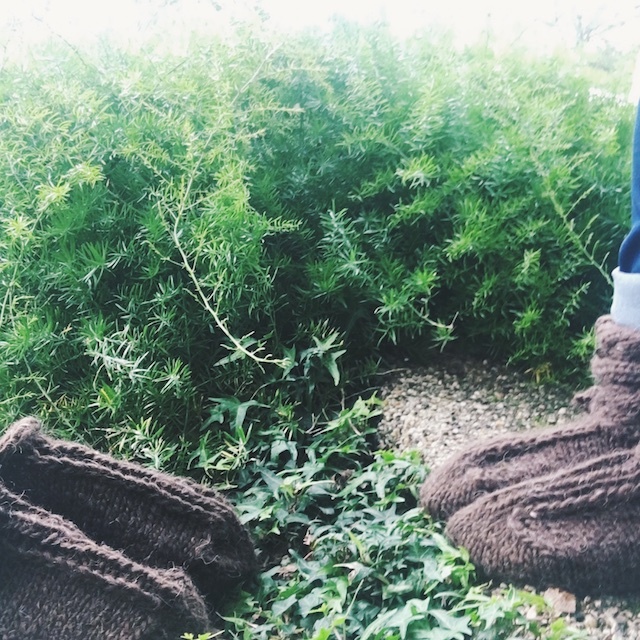 Sadly, it's now flip flop weather, but our barely worn slippers will be waiting for us next winter. That's one knit that is always welcome in a house on piers. I've already mentioned how much I like working with Lopi. It feels sheepy and "real," if you know what I mean. I may have used an Icelandic wool once before for a newsboy-style cap I gave a relative. It was in my earlier knitting days, pre-revelry, so I have no photo of it and am not sure. For my Inniskór, I followed the pattern exactly. Using size US 8 and 9 needles, I went through only 1 1/4 balls of Lopi. That gave me the idea of making a cuff-less pair for my husband. I didn't really think 1 ball would suffice, but I began anyway. It really is a two day project, so the next day I ordered a third ball. I love that magic moment when the sole starts to look like the sole. 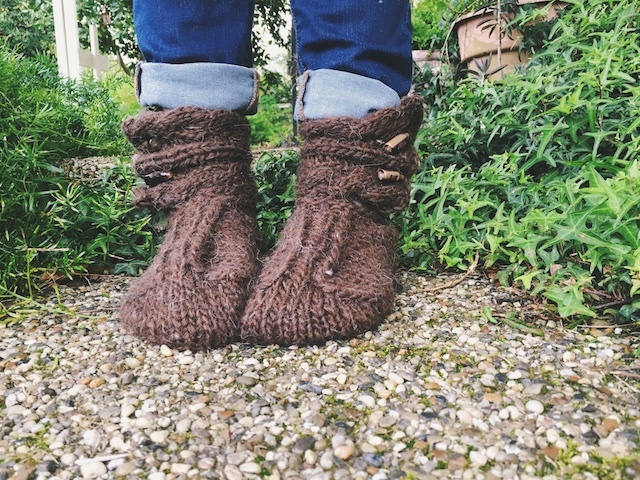 The details: For both pairs of slippers, I used US size 8 and 9 needles and Ístex Álafoss Lopi wool. 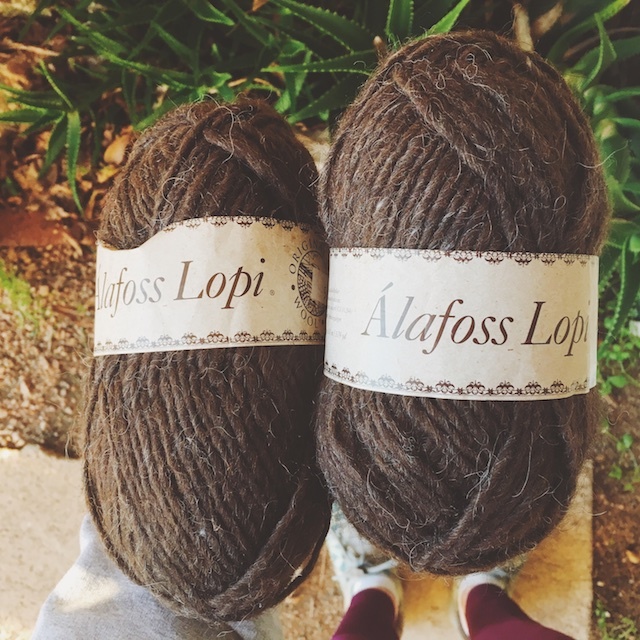 For my pair: I only needed 1.5 balls of Lopi, at the most, for a size medium. When it was time to seam up the sole, I used mattress stitch, joining the very edge of each side, as below. I usually use the first horizontal bars, next to an edge to seam with. But that left a little seam underfoot. 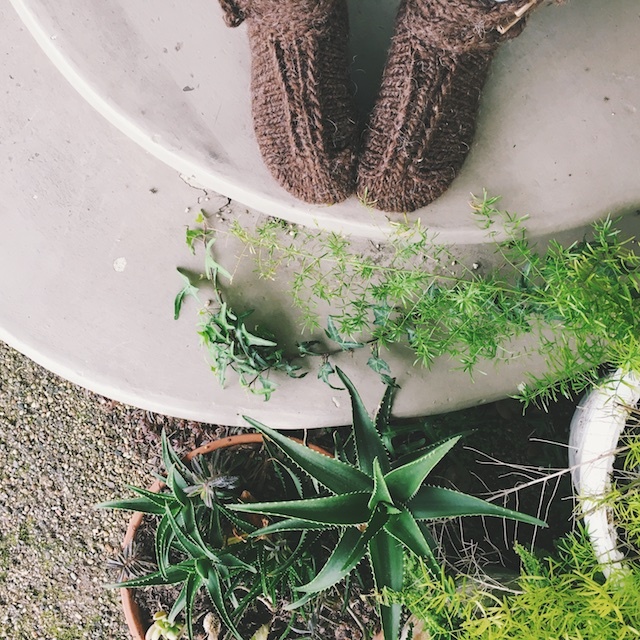 So, for this slipper, I ran my yarn through stitches on the very outside of the piece. Maybe that's the correct way to use mattress stitch and I never realized it. But I thought it was worth mentioning. My toggles were made of horn and ordered via Amazon. Of course, I forgot to use Prime, which was the whole point of ordering on Amazon, and so I have waited until now to finish mine. My husband has yeti feet, so I fiddled with the pattern to approximate a men's US size 12/13. So I cast on the recommended amount for all sizes. 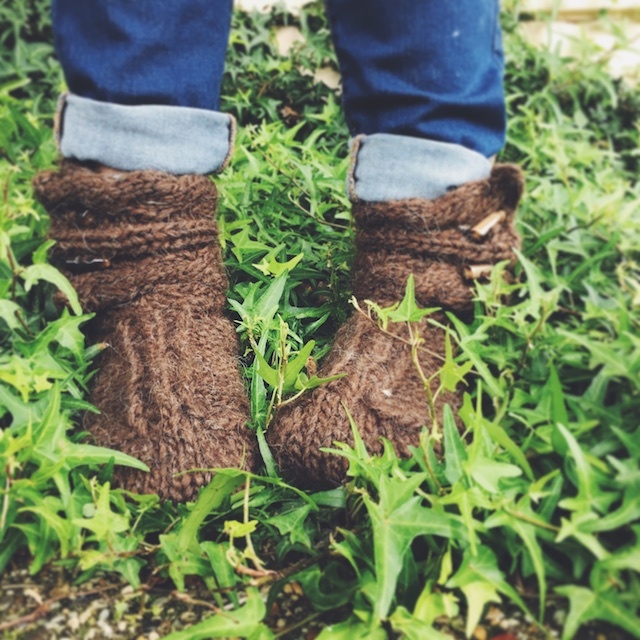 I knit as directed until the end of the sole, where I added two rows in pattern. So the first was a sl1, knit even and the second was an increase row. After joining in the round, I knit one more even row than directed. 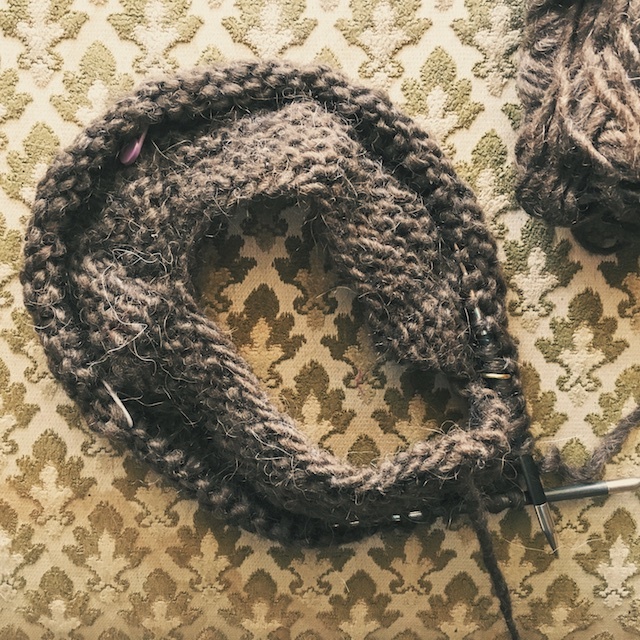 On the next round: I added 2 stitches to the first knit only portion for the largest size, then 1 stitch to the next portion. Repeat decrease round 6 times total. Continue following directions for largest size until toe shaping. 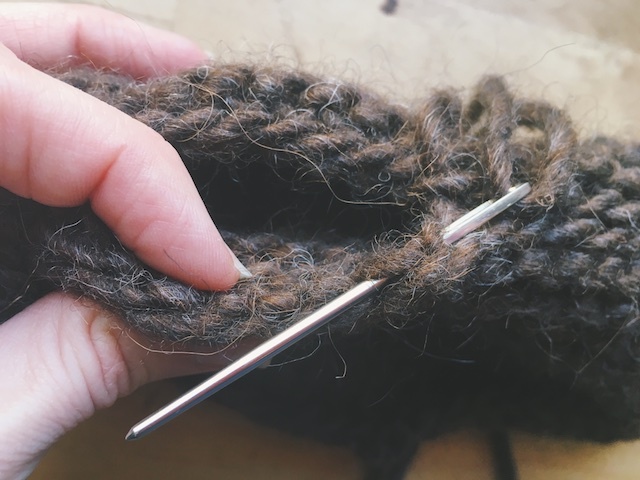 At toe shaping, continue those shaping rows until you have 2 more stitches than required by largest size in the pattern. After last pattern row for ankle, knit 3 rounds even while maintaining the k,p, k, p pattern on top of the foot. For bind off: CO 3 stitches and do an I-Cord bind off around ankle. To close up an I-Cord BO I like to Kitchener my last 3 stitches with 3 stitches I pick up from the first ones I cast on for the bind off. Does that make sense? It always looks cleaner than when I do it any other way. 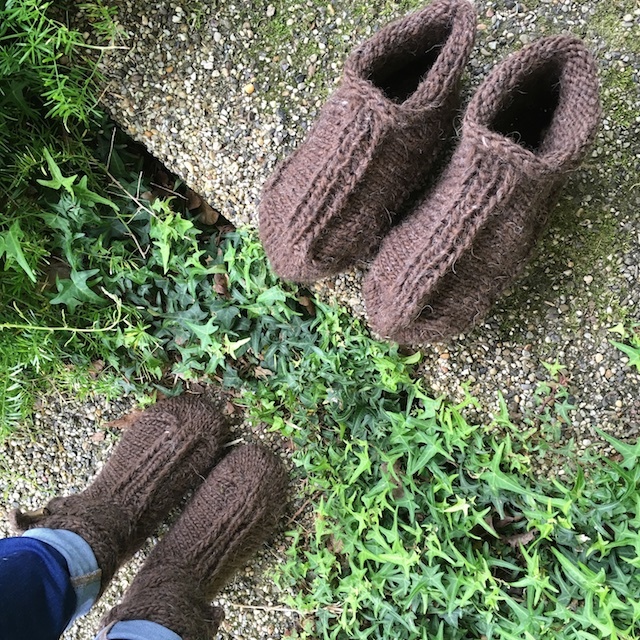 These were knit for The Wool Project KAL on instagram, with designer Chelsea Berkompas. Check out the other beautiful projects, some hand dyed, and all the different breeds used here.